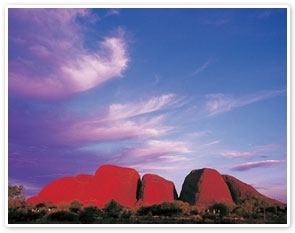 Sit back and relax as you travel into the beautiful Uluru – Kata Tjuta National Park. You’ll be amazed by the surrounds and incredible sight of Uluru in the distance. As you enjoy the view, your experienced Driver Guide will give you an overview of the fascinating history of Uluru – Kata Tjuta National Park. The Aboriginal people have lived in the area for 22,000 years, so there’s plenty of history to cover. Walpa (meaning windy) Gorge is a lush desert haven for plants and animals. The gentle but rocky track will lead you into a world of rare plant species and lush evergreen shrubs known as Spearwood. Your Guide will lead you on a one hour walk through the gorge, sharing stories of local flora and fauna, and the geology of this amazing formation. Arguably Australia’s most recognisable and fascinating icon, Uluru (Ayers Rock) stands 348 metres high, however, most of its mass is below ground level. You’ll be overwhelmed by its monolithic size, presence and inherent spirituality. As the sun sets over the western horizon, you’ll be witness to the majestic presence and many shades of colour for which Uluru is most famous. Be sure to have your Driver Guide take a photo of you with Uluru – although they say that the memory will stay with you forever! Witness and photograph the striking colour changes of Uluru at sunset while enjoying nibbles and a complimentary glass of wine. This tour also includes an Uluru BBQ Dinner. Travel to our exclusive venue to enjoy a barbecue dinner including steak, sausages, kangaroo meat, salads and bread with sparkling wine. There is time for stargazing too (weather permitting).